Earlier this week, Michael Wright of ESPN Chicago reported that Brett Favre "would listen" to the Chicago Bears if they came calling and attempted to lure him out of retirement this season, even though it was considered "highly doubtful" that the team was even interested in the possibility. Over the past few days, we've also heard from Bus Cook, Favre's agent, who says that he "doesn't know" if the gunslinger would listen to the Texans, the Chiefs, or the Ice Capades. "It's all speculation," Cook told us on Monday. "He's retired." Shelve your Wranglers and put those No. 4 Bears jersey orders on hold. Brett Favre says he's happy being retired. "Inspite (sic) of reports about playing with various teams, I'm enjoying retirement with my family and have no plans to play football," Favre said in a statement Tuesday night. One day after a source told ESPNChicago.com's Michael C. Wright that Favre would listen to the injury-riddled Bears if Chicago came calling, a high-ranking Bears source told ESPN's Ed Werder on Tuesday that the team has no interest in signing the 42-year-old quarterback. Favre denied there have been any talks with teams about ending retirement. 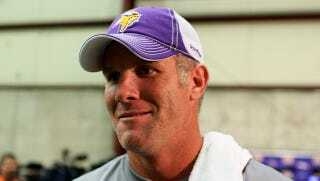 "I haven't contacted nor have been contacted by any teams and all reports are inaccurate," Favre said. It's the perfect little story circle, really: ESPN talking to ESPN. In the future, when bloggers are replaced by robots, all sports news will be someone at ESPN reporting on what someone else at ESPN just reported.